Ok, so this could be a rant. Do you know what’s been hogging the Malayalam news headlines the last few weeks? I’ll give you some clues – not inflation, not the oil-price hike, not the strikes/hartals by the omnipresent Commies, not global warmning, not the Aarushi murder case, not any murder case, not Santhosh Madhavan and finally, not even Euro 2008 or the just complete Tri-series in Bangladesh. What else can it be? It’s the story of how a proverbial mole-hill was made a mountain by the I-have-nothing-better-to-do brigade of, get this, people from the Mallu film industry! So here’s the whole deal – once upon a time in Kerala (approx 4 years back), there lived a producer Tulasidas. He used to make movies. Along the same time, there lived a very popular actor, Dileep. He had a lot of hits and was one of the hottest stars in the industry. So our man Tulasidas gets dates (the calendar ones, for purely platonic purposes, mind you) from Dileep for an upcoming movie and pays him 40 lakhs for the agreement. All was good and done. Then one fine day, Dileep decides he doesn’t want to act in that movie anymore (director had a lot of flops, the script was not ready, yada yada yada) and tells Tulasidas that he can’t keep his dates and he’s willing to give the money back. All of it. And what happens then? Tulasidas decides he’ll have nothing of it and goes to town saying Dileep must (MUST MUST MUST) act in his movie, he can’t just give the money back and go. Dileep doesn’t care, basically asks him to take a hike around the world. Now till this point it’s just an issue between one director and one actor. But then, one forgets that it’s Kerala. Nothing is between just two people. It’s somehow twisted and turned to be between the down-trodden working class (even if they happen to make crores in the film industry) and the arrogant one-man capitalist. Always. So what does Tulasidas do? He goes crying to MACTA (Malayalam Cine Technicians Association) and the general secretary of MACTA, director Vinayan decides enough is enough and convenes a meeting with all the executive members (which includes the whos-who of Mallu filmdom) and announces that all Mallu movies will be put on hold if Dileep doesn’t act in Tulasidas’ movie. Hah! But then, one of the directors in that meeting, Siddique, got up and said that film-making was his bread and butter and he cannot stop doing that just because two people in the industry were having some issue. And what does Vinayan do? He goes up to the mike and says something to the effect that ‘people’ will tarnish their wives also for money these days (put very very mildly). Siddique sees red ‘coz the comment came exactly after he gave his opinion and he says ‘people’ actually refers to him. This is enough fuel for the entire industry to burst into flames and split into two. Big guns like Siddique, Sibi Malayil, Fazil, Sreenivasan, Priyadarshan and Sathyan Anthikad resign from MACTA. The Mallu actors association (called AMMA) takes Dileep’s side. MACTA is on Tulasidas’ side. There’s the third front formed by the breakaway faction of MACTA who just want to get on with their movie making. Now add to this other ‘associations’ like FEFSI (South Indian film federation) and ABCD and XYZ, you have a full blown crisis on your hands. And the media, ofcourse, has a field day (actually weeks) running live updates on every single meeting between these ‘associations’. Why am I all frustrated about this? First, I have to watch the darn news and I have absolutely no interest in such issues of ‘world importance’. Second, I’m sick and tired of the Commie way of doing things where common sense is chucked out the door and the common man is made to undergo difficulties because some bloke up there on a red throne said so. WTH! Thanks to these trade unions, if I had to move house in Kerala, I can’t do it myself! I have to call the trade union guys to do it for me and then pay through my nose. Did you guys know that? Say I have 3 huge couches to move and I have 5 of my friends/cousins who can help me move it, I still can’t! The union people just won’t let me. I have to call their guys, use their lorries and do the moving. And what’s worse? They will unload the material only till the gate. Not till inside the house! Again, WTH! There are no movers and packers to neatly pack your stuff in the old house, move it to the new house and unpack and arrange the things in the new house. There are no movers and packers. Period. Maybe I don’t have the whole picture. Maybe I don’t know the other side of the story. But from whatever I know, this just seems the most unfair way to do things. And that frustrates me!! Is it like this in all Commie ruled states? How about West Bengal? Any better there? Does Communism in it’s original format even hold good in today’s times? In India, at least? We all know China is the other extreme, but what the heck is happening here? Update: The name of the movie is ‘Marigold‘. Enough reason why all 15-20 frames they showed in the trailer were drenched with orange. And there’s at least one scene where Salman teaches Larter hindi. Enough said. Especially by someone who doesn’t want to watch the darn movie! I’m out of ideas for my next post (yes, yes, go party. But I will come back with a vengeance, mind you). So what did I do? Recycle, ofcourse! The following post was originally published on January 14, 2006 A.D. Although it was very warmly welcomed on the blogger’s erstwhile mainstay blog (on Yahooo 360), it did not have any impact on the blogger’s current mainstay blog (this blog). Hence the re-attempt (apart from other sundry reasons). Also, please note that the content and language of this post is from early 2006 A.D. and might be out-dated as of today. By the time you finish the post you would also realize how much the blogger has grown over the past 1 year with respect to this blog and blogging, in general. 1. If the engagement ceremony of the hero’s sister is shown with unusual aplomb and fanfare (with a song in which the hero has to sing his sister’s praises and dance), then the marriage will not happen due to some horrible reason and/or the sister will die in very sad conditions. This is, however, not applicable to Suraj Barjatya movies – his movies are all one big ceremony after the other. Corollary – If the hero has a sister, she will be raped by the villian and/or she will die. 2. If anybody wearing spectacles removes them, someone has just died or been diagnosed as a terminally ill cancer patient. It will usually be someone closely related to the hero. 3. It’s perfectly normal for the hero and heroine to jump around and dance – even in the middle of Mount Road. 4. Even if the hero is a pauper, he will wear jeans and his jeans will be a Levi/Lee/CK..worst case Pepe. Don’t even get me started on the shoes. 5. All ghosts will wear a white saree and leave their hair untied (all ghosts are female unless specifically picturised otherwise). They will generally loiter around at exactly 12 o’clock outside the heroine’s house. They will also sing creepy-tuned songs – and the heroine will scream only after the song ends. 6. The villian has to give a big speech to the hero (who’s help captive) about how he managed to do all that he did (the hero was dumb enough not to know) and then boast about killing him finally. This will give time for the hero to send eye-signals to the side-kick to do something equally stupid and get out. 7. Whenever the hero comes to see the heroine (jumping gates and climbing walls) just like that, he will not be caught. However, the day he comes to take the heroine with him, the heroine’s dad will see him and catch him or atleast chase him to the nearest tall building/hill-top temple (depending on whether the movie is in the city or a village). 8. The hero’s side-kick will be dumber than the hero, but smarter than the villian (read point 6). The villian’s side-kicks will have an IQ of a teaspoon. 9. If the heroine’s dad wants to send her abroad (because she loves the hero ofcourse), visa formalities will happen overnight. Flight tickets also will be booked (and confirmed actually) overnight – even to the USA! It will mostly be USA. Or Canada. 10. Heroines cannot commit suicide. They just will not die – someone is usually around to kick the door open and take them to the hospital. P.S: Bless the soul who put an entry in Wiki for Mount Road! Rasiya is a young Muslim woman in a little place in Kozhikode. She lives with her infant child and her father, near the backwaters of Kerala where it rains for 6 months in a year. Her husband, Akbar, works in Saudi Arabia and like most families from the neighborhood, had struggled to go there and is now struggling to save some money and come home soon. But Rasiya’s world crashes down on her when she hears that Akbar has been imprisoned in Saudi on charges of killing another person. The sentence for the crime was death by beheading. Ganga is a young woman from a staunchly orthodox Palakkad Iyer family. She lives with her in-laws in an Agraharam with her baby daughter. All is well with Ganga, until she receives news that her husband has been murdered in Saudi Arabia. But all is not lost for Rasiya, for then she comes to know about the only way she can free her husband – if the wife of the murdered man signs a letter of pardon. If Ganga signs a letter of pardon. This forms the setting in Kamal’s Malayalam movie, ‘Perumazhakkalam’ (roughly translated as ‘Rainy Season’) which sees Meera Jasmine play Rasiya and Kavya Madhavan, Ganga. The narration is poignant, and the ever-present rain in almost every scene of the movie brings out the pain all the more – for isn’t a rainy day a gloomy reminder of how even the weather is not cheerful? The rest of the movie depicts the struggle of one woman desperate to save her husband’s life and another who has already lost her husband and holds in her hand the life of the man who killed him. This movie got me thinking on this amazing human emotion called forgiveness. It is amazing because it is hard to comprehend from where can a person find it in him or her to forgive someone for their wrongdoing. It can be as simple as a case of misunderstanding between two close friends or as grave as the situation brought about by the story above. What makes the story less complicated, perhaps, is the fact that Raghu dies as a result of an accident, when Akbar was beating up another guy who owed him money. In a scenario like that, we, the viewers, feel that Ganga should sign the pardon and free Akbar because it was not intentional! But Ganga’s words to Rasiya conveys a different pain – ‘You can stand in front of me and cry for your husband’s life. And I might even give it. But if I stand in front of your husband and cry for my husband’s life, will he be able to give it to me?’ The question leaves Rasiya speechless. But her determination in reaching Ganga, more specifically the woman in her who knows what it is to become a widow, does not falter. I read somewhere that forgiveness is giving up my right to hate you for hurting me. Sounds fair enough. When I’m hurt, when I’m being betrayed, the least I can do is be angry with the perpetrator. The least I can do is refuse to forgive him or her and let the person bear the weight of their mistakes for the rest of their lives. The least I can do is let myself bear the weight of that hatred and anger for the rest of my life. But the best I can do is to forgive. And get it over with. For didn’t the Lord ask us to pray thus? ‘Forgive us our sins as we forgive those who sin against us’. We ask God to forgive us like we forgive others. When God forgives us if we truly repent, why can’t we, humans, do the same? Simple answer – because we are not God! Not even close. Which probably reiterates the notion that to forgive is divine. Because it takes a lot to let go of our anger/hatred and tell the person that we forgive them for their trespasses. Getting back to the story, the other aspect that the director has portrayed beautifully is the mindset of Ganga’s in-laws. Hearing the news of the death sentence, the father-in-law asks his son to arrange for special prayers at the local temple as a mark of thanksgiving. It actually translates to a state of rejoicing at one man’s impending death. The way the family behaves with Rasiya when she comes to their doorstep asking for Ganga is very realistic, given that she is the wife of the man who killed their sole breadwinner. Does Ganga sign the letter of pardon, after all? Will her in-laws let her, even if she wants to? Can Rasiya get her husband freed before it’s too late? Well, that forms the rest of the movie! After watching this movie, I realized that there are a lot of other emotions entwined in an act of forgiveness. There will be doubts in one’s mind whether it is the right thing to forgive and forget. There could be a feeling of unease that once you forgive you give up the last right you had to feel hatred towards the person who hurt you. But then, there will also be a sense of peace to know that you have forgiven and are moving on, a sense of closure to all the pain and anger. And finally, if it involves another person’s life, like Ganga is faced with, to forgive is, indeed, divine. Update: I’m told that Nagesh Kukkonoor (‘Hyderabad Blues’ fame) has used this very same story in his recent Hindi movie, ‘Dor’. Reviews on the www tell me the movie is worth watching, so maybe I will. Remember the cute pink tiger waltzing around the screen to this unforgettable tune? 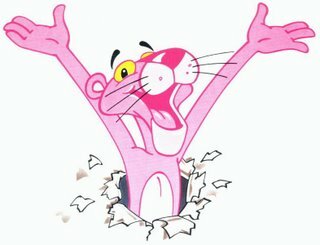 After watching all the mundane and hardly-funny ‘comedy’ movies floating around, Pink Panther was a welcome relief to me. It’s a story of the ever-fumbling comical French detective, Inspector Clouseau (Peter Sellers), trying to catch the Phantom, a jewel thief who’s out to steal a diamond belonging to a Princess. Things get a bit difficult since Clouseau’s own wife is an accomplice to the Phantom! What I loved most about the movie was the effortless humor almost in every scene. Some people would find it silly – sometimes, too silly to even deserve a laugh – but that does not apply to me! 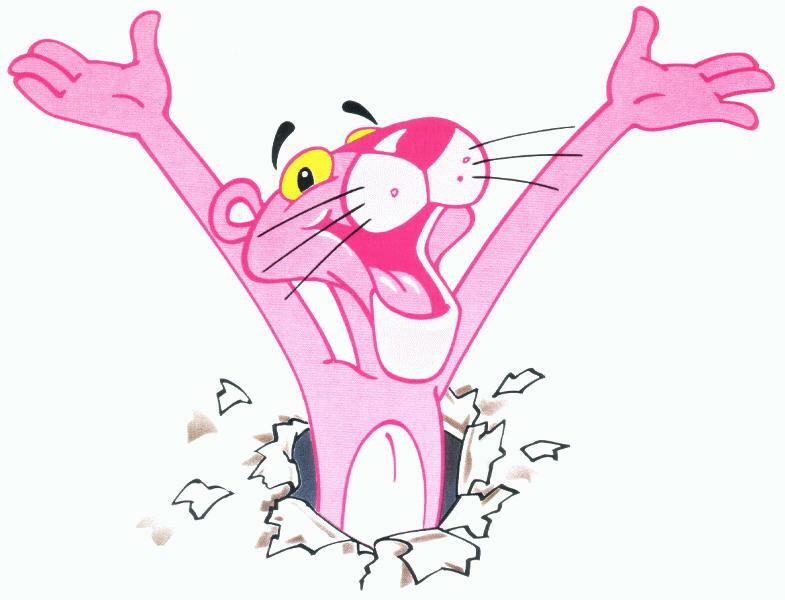 Also amazing were the starting credits with the Pink Panther! OMG, I died laughing – never before have credits been so interesting and funny in the entire history of my movie-watching! The movie was also released recently with Steve Martin playing Clouseau, but I doubt if he would do as good a job as Sellers. The accent, the clumsy behavior (he cannot walk in a straight line without knocking over atleast a flower-pot, a table and/or his own Stradivarius) – man, he rocks! The movie has an old world charm to it (it is old – released in 1963, or so IMDb says) and the costumes and sets are way cool. Well, if it’s a weekend afternoon and you got nothing better to do, rent this movie and catch some laughs. Totally worth it! I know I’m late, but had my own Christmas celebrations with my better half and didn’t get to even open the laptop. But hey, better late than never! SPOILER ALERT!! – If you haven’t seen the movie yet, but intend to, please don’t read on. If you have read the book, you know what I’m talking about – the first scene in the movie with Harry’s dream about Wormtail and Voldemort in the Riddle House – well, they also show Barty Crouch Jr (the one who impersonates Moody) in the dream!!! Can you believe that??!!! there’s more – they did not show the Quidditch World Cup match – I was dying to see the Wronski Feint by Krum, but no..they just didnt show it! No Veela, no leprechauns – nothing!! There was nothing about Winky the house-elf (so you can imagine how distorted the plot is if there is no Winky tugging an invisible Barty Crouch who casts the Dark Mark in the sky). The director seems to have taken a lot of liberty with the story line – in the second task, Harry gets the gillyweed from Neville – not Dobby! There’s nothing about Rita Skeeter being an animagus. And the biggest lapse of them all – the third task in the maze was the letdown of the year!! They did not show any obstacles at all in the maze – just the scary looking maze and Krum trying to jinx Fleur and Cedric. No sphinx asking questions, no spider attack on Harry and Cedric, no fog that turns the world upside down, no Blast-ended Skrewts – nothing, zero, zilch! There was way too much dialogue between the characters and very less action. But surprises that I liked – the scene with the Durmstrang ship coming was too cool. So were Victor Krum and Cedric Diggory and Hermione. Mad-eye Moody was ok – I’d imagined someone less fat though 😉 Snape did some comedy – shocked eh? Well, no comments on that one. Loved the scene were Malfoy is transfigured into a ferret by Moody. There was a scene were Prof McGonagall teaches the class to dance – it’s not in the book right? It was good though – especially with Ron, Fred and George (who look cool btw). The last scene in the graveyard with Voldemort rising was really well-taken. Voldemort rocks! Looks just like the descriptions in the book. The best part about the movie were the actors – they were absolutely amazing! Daniel Radcliffe was mind-blowing (forgive my choice of words for superlatives – I’m not such a good review-writer – I just write what comes to my mind). Emma Watson – she was really really cute (hubbie dear liked her the best!) . No comments on Ron. The coolest was Draco Malfoy – he actually looks handsome and..for want of a better word – yummy! Dumbledore was good, his costumes could have been better though – he walked around in what looks like a faded, old nightie for cryin’ out loud! Madame Maxine was good too – she actually makes Hagrid look normal. The Beauxbaton girls and Durmstrang guys were awesome – the introduction scene for them was great. I know its a 2.5 hour movie and you cannot have the full book in it, but some parts were outrageous. A person who hasn’t read the book (like my husband) would never appreciate the true beauty of a Harry Potter tome if the movie is like this! Then again, I don’t think any movie that’s completely based on a book can do full justice to all aspects of the book and maintain the nature of cinema at the same time. 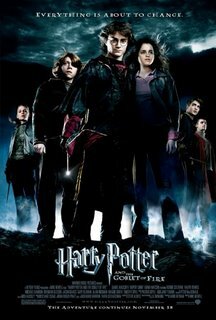 End of the day, it’s still a HP movie and I’m always a very faithful fan – so I can tolerate the movie! 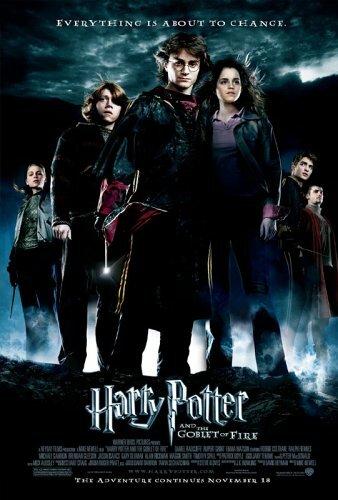 The movie is worth watching only once – I say only once ‘coz for me, the rest of the HP movies can be watched any number of times. Not so for the Goblet of Fire. Loved the IMAX experience though – but that’s a topic for another post! So long then…Buon Natale again folks! Hope you had a wonderful miracle-filled and jolly Christmas!